I bought flowers seeds on eBay and I think the seller mixed the seeds up. I have these pretty flowers that start as a long tube and then usually bloom in the evenings or on cooler days, and then the flower closes after about 2 days and a little spiky ball forms which is a seed pod. Can you please tell me what these are? Thanks in advance, you guys are the best. 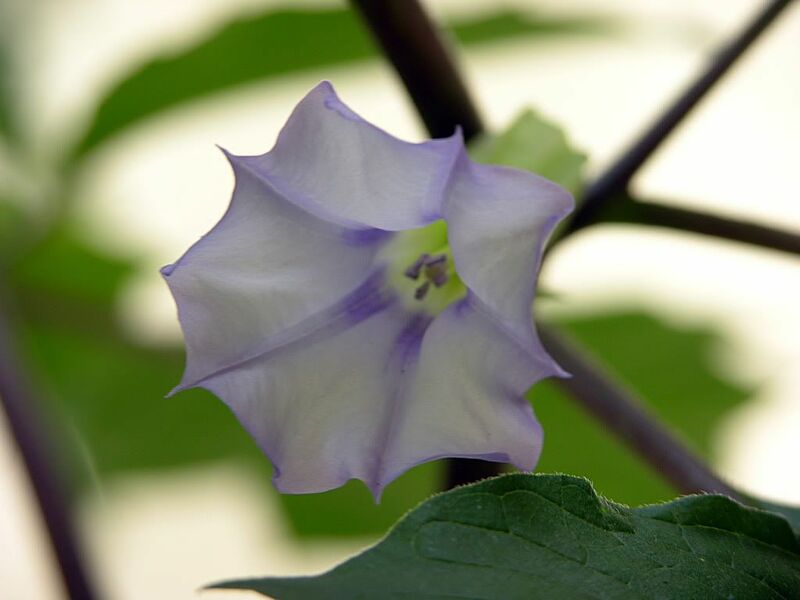 They almost look like moon glories when they're in bloom but they are big and they aren't vines. 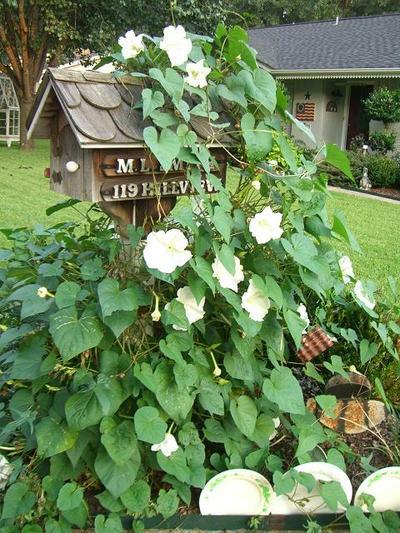 First thing that came to mind when I saw your pictures is a Moon Flower Ipomoea alba. Moon flower is a vine but it looks like you have it growing as ground cover perhaps? 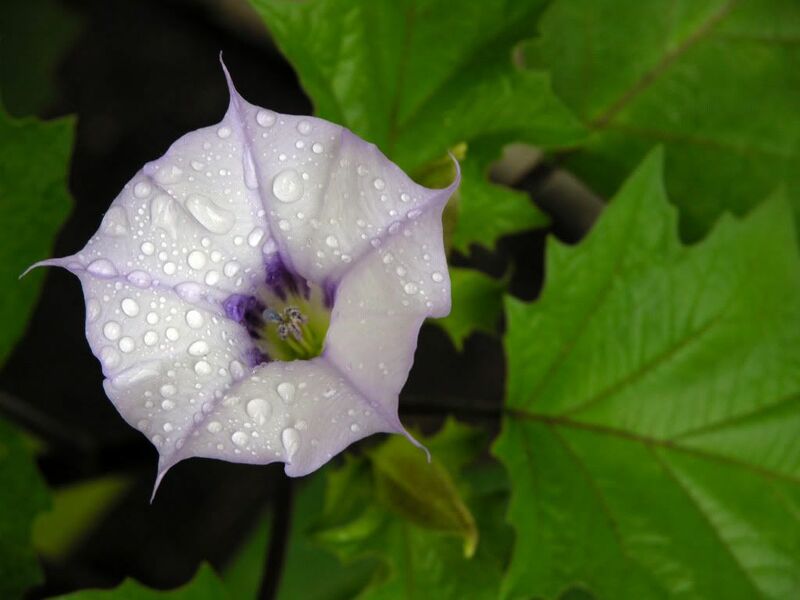 The habit you discribe is like the moon flower as well blooming during the night hence the name moon flower. Hope this helps. AH HA!! I figured it out!! lol They are called Datura meteloides.... I think lower growing and shrubby with upright flowers that can reach as large as eight inches. YES! That is them! You are the best! Thanks so much for the QUICK and informative reply. Your so very welcome Always happy to be able to help. Poisonous. As in, really do not stick your face in them for the lovely scent. Lots of poisonous stuff, especially in Florida yards, but the Datura spp. and related Brugmansia spp. are possibly more dangerous than oleander. @thanrose: Oooh, they are very poisonous? I handle the seed pods and seeds, should I be extra careful when doing so? I am a little OCD about washing my hands anyways but it's good to know. @LindsayArthurRTR: Peach colored, how beautiful! Would you like to trade seeds? I have more than enough seeds from these, hundreds! I would be willing to trade them if you're interested. Mia: they're Very Toxic; all parts of the plant contain high concentrations of Atropine and Scopalamine. Wear gloves. This said, I just love Daturas, and I grow the purple-flowering D. inoxia and D. stramontium in my yard because I just can't get enough of the lovely, delicate scent as well as the colour, which is just a little different each time the plants flower. I'm as careful with them as I am with my Oleanders, though - I wear gloves to handle the plants and their seed, and I carefully wash and sterilize my tools after cutting them. How does one kill them? I have them all over my yard. I chop them down and they return. Nothing will eat them either! Blowtorch actually works pretty well to kill them. So does pulling them up before they bloom. Blow torch time, they are all in full bloom! @lorax and thanrose: Okay, they're highly toxic. I believe I can deal with that. The only problem is, I didn't realize how big they would get and how much they would spread. I would like to move them to the back of my yard along the fence line. I have a small dog who goes into the yard but she doesn't mess with the plants much, she's a prissy papillon, she couldn't get sick from brushing past them could she? If so, I am going to move them AND fence them in. But wait, do they transplant well? Can I cut them down and transplant them? I should just be sure to dispose of the cuttings and wear gloves when handling them, correct? Any advice is appreciated. Otherwise I will just pull the one I have and throw it away and start new plants towards the back. Will they do well in partial shade? THANK YOU! @lorax, BTW, your flowers are gorgeous. I have double purple datura metel growing and they are about to bloom for the first time! I'm so excited.